Beautifully restored holiday house for a large family or group of friends in a glorious setting. 6 bedrooms, large open plan kitchen, terrace, and lovely swimming-pool. 10 minutes from Marsanne village, 15 minutes from Montelimar, 60 minutes from Avignon. Spectacular view of the plain of Marsanne, surrounded by the Vercors and the foothills of the Alps. 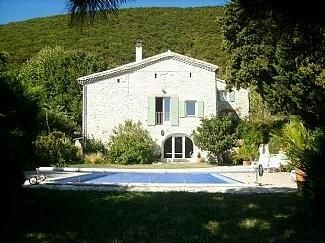 A wonderful family house for complete relaxation, from which to discover the Drome, the Ardeche, Provence and beyond. We have owned our beautiful house in Marsanne for over 20 years, and during this time we have refurbished it completely and turned it into a much loved home. We have been coming here since our children were tiny and now even as teenagers and young adults, this is always a firm favourite! This is fantastic holiday house which we have owned for 24 years. The house is situated in a beautiful area, perfectly located for discovering more of Provence, the Ardeche and the Vercors regions. It is a perfect holiday house for doing lots or very little beyond sitting by the pool. Stunning views, great walking, 3 fantastic restaurants in the local village, and wonderful provencal markets galore . We have spent many happy summers here and hope you will too. Large and very comfortable. The house is on split levels which allows even the largest of family groups to find a quiet corner. Bathroom 1 with bath/shower, basin, wc. Bathroom 2 with bath, walk-in shower, basin, wc. Bathroom 3 en-suite shower room, basin, wc to Bedroom 1. Bathroom 4 separate wet room with shower, basin, wc to Bedroom 6. Large open plan living area with log fire. 2 sofas and several arm chairs. Golf de la Valdaine, 26740 Montboucher-sur-Jabron, France. 15kms away, 25 minute drive. 18 hole course. Avignon Airport (110kms, 1hour 20 minutes driving). St Etienne Airport (170kms, 2 hours driving). Lyon St Exupery Airport (170kms, 2 hours driving). Montelimar Rail (17 kms, 25 minutes driving). Valence Chabeuil TGV (40kms, 50 minutes).